The latest album from Bentham band Dohnut (formerly known as eating disorder) has more front than a contingent of punks gatecrashing a 90s rave. I Scream, You Scream is the follow up to the six piece collective’s debut Eat More Cake, and features songs that have been prevalent in their live sets for a while. It kicks off with a big groove in the form of Rave Superstar No 1 - bass, drums, wah wah guitars and spangly synths combine to rival the massive opener People In Dub from their first album. The groove continues with Weirdo I Love You and Rocket, female vocals adding smooth overtones. For me, Eat More Cake was always going to be a hard one to beat. Its style and energy is unique, however the band has taken I Scream, You Scream in a different direction. There’s more of a pop/punk vibe, it’s simpler, catchier, and opening sample vocal “I’m getting older and I just want to relax and enjoy life...” indicates a less vexed approach. It’s no less funk filled however – We Made A Spark is a dubby, solid stomper of a song, and precedes the fun, more naturally punk/ska sounding Big Gaye Al. Butcher is definitely a grower, and for those that remember Scottish electronic band The Shamen, there’s a real treat in the form of a cover and rework of their 25-year-old single Move Any Mountain. There are shades of edgy techno darkness creeping around the perimeters of the album too. 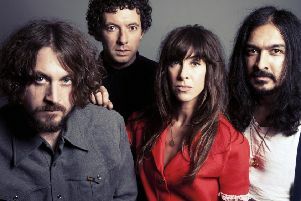 Part of the band’s appeal is their refusal to conform, their theatrical stage presence and imagery, their genre hopping style and their nameless, enigmatic band members (1 - 6) each bringing something unique to the table . It’s been a busy year for Dohnut following a raft of festival performances across the country and supporting punk icons The Damned. I Scream, You Scream pulls all that together and is something solid to grab hold of in what has been a tumultuous, confusing 2016. The album is available at their bandcamp page on CD and digital download.